How many flavours have we seen 180SXs presented in? Too many to count. For a model that’s been around for a quarter of a century, it’s only normal that owners have attempted to keep their cars aligned with the times. While we enjoy seeing how people continue to rethink what has become a somewhat legendary rear-wheel drive base, at the same time it’s refreshing to see 180SXs approached in a more unique fashion. Case in point: this RPS13 that I came across at last weekend’s Sagamiko Skyline Meeting. This is how a lot of guys back in the early-to-mid-’90s were approaching their 180s; simple aggressive lowering and a cool set of wheels went a long way to getting the car to look its best. 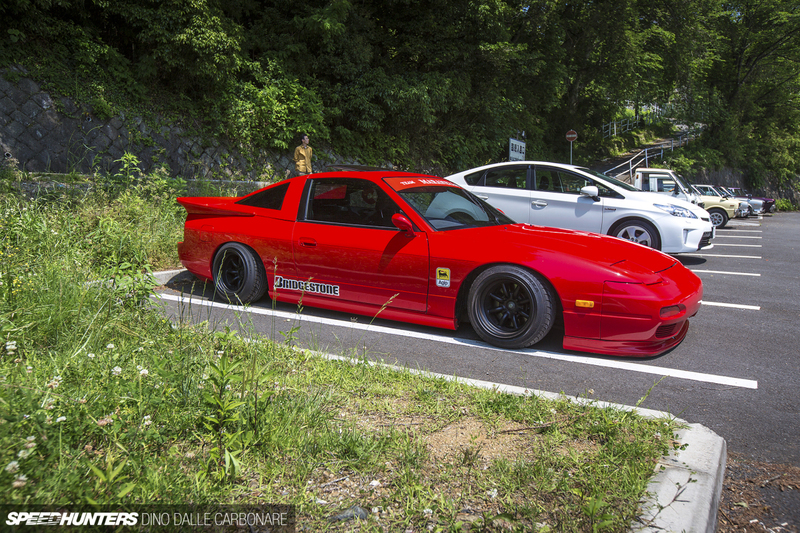 The owner of this particular example has added a few cool details along the way, like a front lip and skirts. The 14-inch Watanabes are a well chosen addition too. With stretched rubber along for the ride, they help tie the car into an era of cars that was only a generation gone at that point in time; a sort of nod to say that the coolness of those years hasn’t been forgotten. 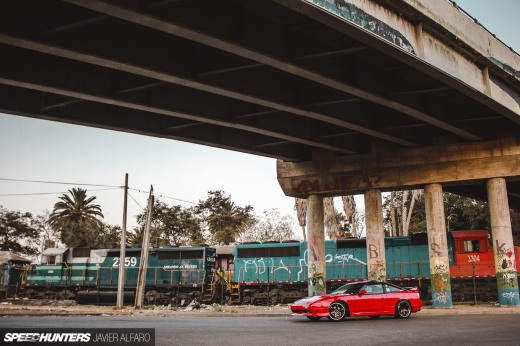 It makes even more sense at the back, with the hatch that characterises the rear of the 180SX having been replaced with a speedster-like conversion piece. The small vertical glass and that flat extended area carved out of what used to be a smooth, flowing rear end, now resembles that of a Kaido Racer S30 Fairlady Z or similar. 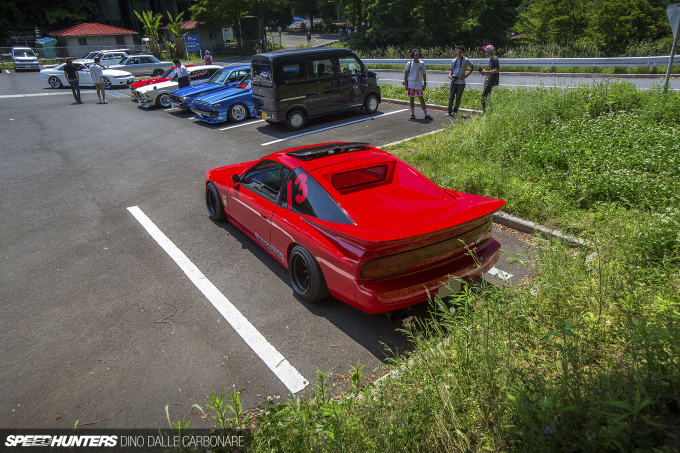 It’s all mated to a wrap-around moulded spoiler; again a popular detail from the era. The zenki rear taillights have been hidden with strips of red tape that make them camouflage better with the exterior’s deep red paint. Then there’s the Agip stickers on the front fenders and the ‘Team Maranello’ windscreen banner – a nice, albeit cheeky nod to Ferrari. 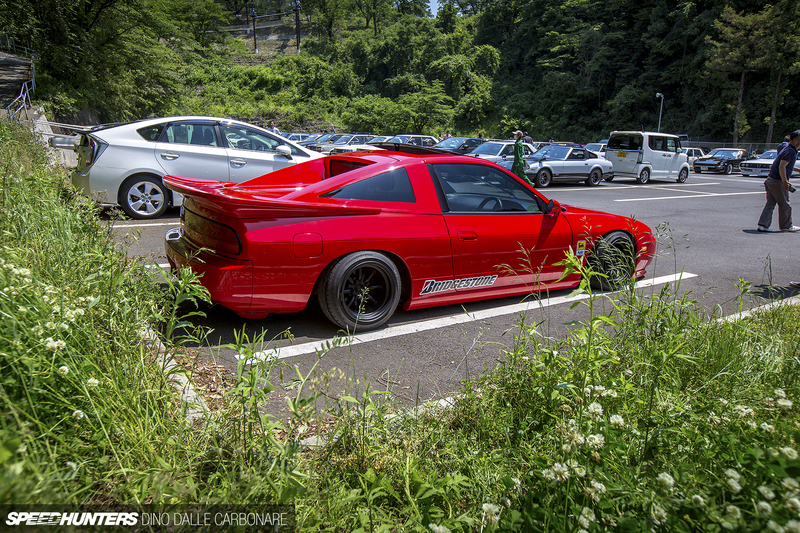 A variety of details and flavours help create what may well be the most spot-on 180SX I’ve come across in the last few years. So remember, thinking outside the box can win you big points! I wouldn't if you swapped the engine for an RB26DETT! I remember a while ago seeing in Jalopnik a commenter that posted his car: a Mustang Fastback from '67(???) with a Gulf livery and a 2JZ, to me, it was unbelievably awesome. To be honest, I wouldn't even rage at all as long as they aren't placed with a negative camber angle close to 45*, Watanabes and a Mustang should be a W-I-N.
BTW: I just realized I also responded to you on another article where I absolutely disagreed with what you said. Isn't it a lovely world? Lol indeed it is. I was trying to find the other comment out of curiousity but couldnt find it. gcvphoto Turbology Not true, if its before 91 it could be a CA18 if after 91 it would be an SR20. Or could of been swapped out for anything. 7:34 pmMay 26, 2016 ra64freddy! Nothing but love for Hot Rod's Rari.. Absolutely gorgeous, I just wonder why the mismatched rear windows? How does the owner of a car this low jack it up? Ramps won't even help. Anyone have an answer? Lord have mercy this is good. Turbology It's RPS13 - that P letter means it has SR20 engine in it. And after all as willis85 said 180 has CA18 engine only up to 1991. To first facelift. CMCurtis hcram39 Both sides are blocked anyway by the rear window being recessed anyway, it's just for looks, I suppose. PolarGrey Minilites would be "better" since T/A Boss 302's ran them, but there's nothing wrong with Wats in my eyes. hcram39 It's a nod to the Nissan Cube LOL. I've got a S197 but I think some fat Watanabes would look amazing on a SN95. 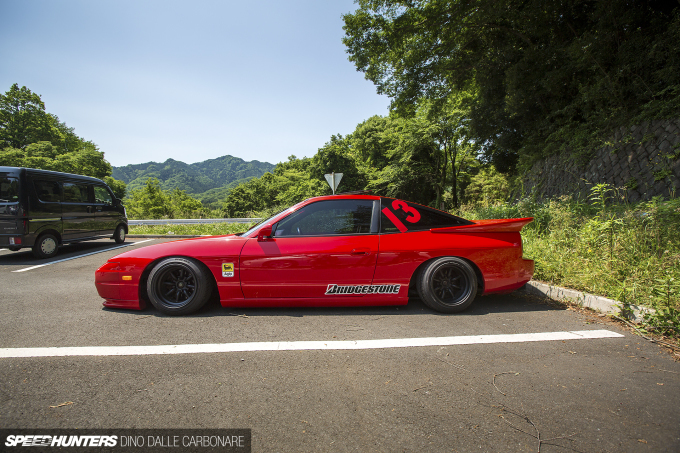 I had decided that red is the best color for an S13, and this just cements it. Absolutely gorgeous. 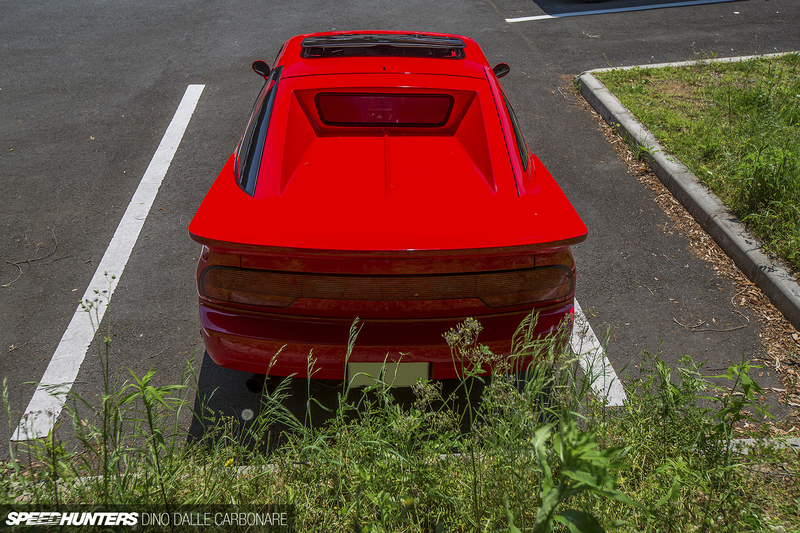 It's a "Pantera" hatch. 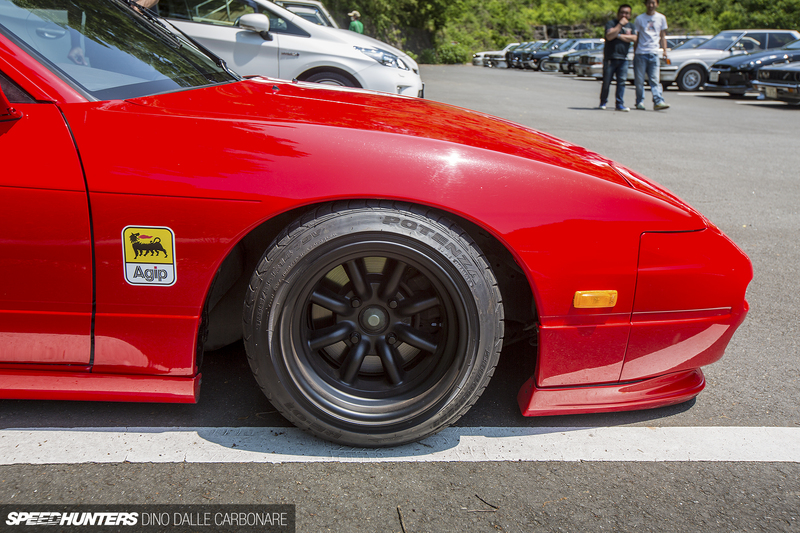 In the style of the De Tomaso Pantera. A lot of 240zs have em. I saw this on Shirtstuckedin. Looks so dope! hcram39 Previously he had both sides covered with the red "framing" that you're seeing on the right so it'd be interesting to find out why the left has been replaced with the 13. I see this all over instagram on a regular basis. It stands out to me because it's so clean, and since long before I can remember it will come up in my feed at least once or twice from various different accounts every time I check it, lol. The FB RX-7's had an optional wing very similar to that as well, classic JDM goodness. 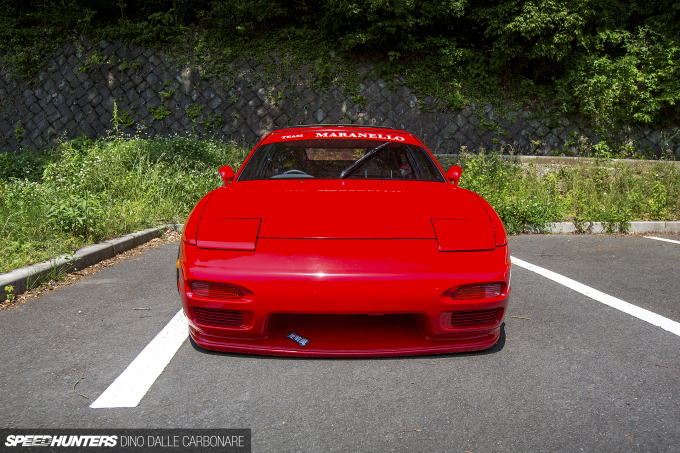 Now somebody on here must know what that front lip is...... Thinking custom, definitely not east bear, but if anyone has a clue, let me know!! Nice work Dino. Great article as always. 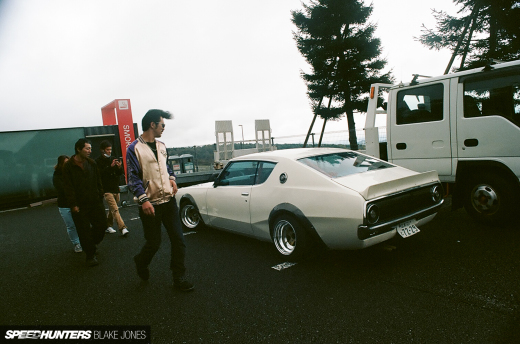 The cars in Japan never cease to create new ideas for people all over the world. They dare to be different and the world follows.